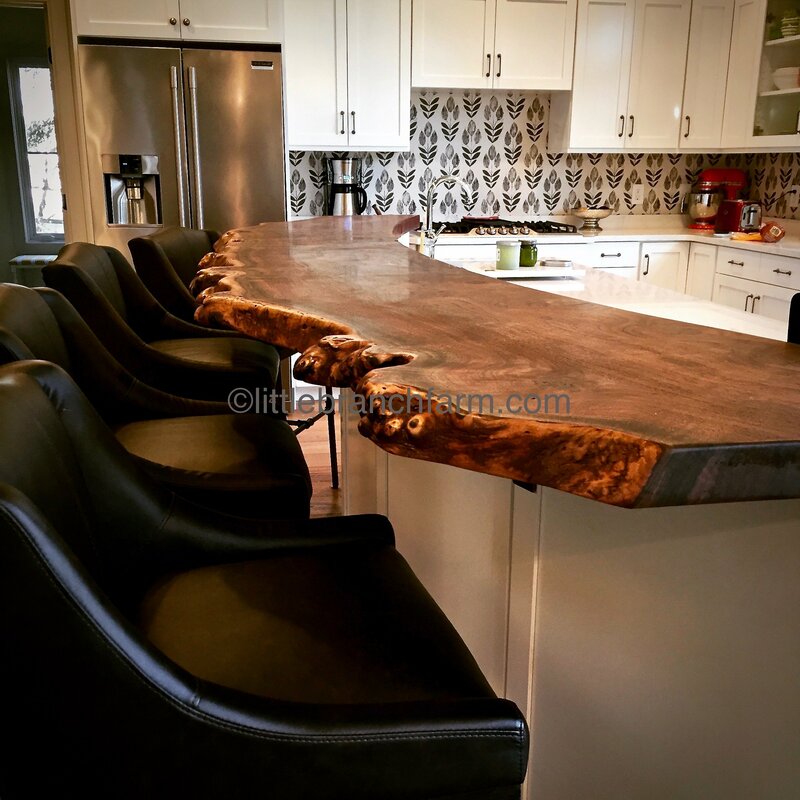 What is a live edge table and why the growing popularity? Simply stated this style wood table brings nature into the decor of our home. Although this style of natural wood furniture is growing in popularity it has been around for many years. They are also known as a rustic table, natural wood table, burl wood table and many others. But whatever the name they allow us to bring the calming effects of nature into homes as functional furniture. 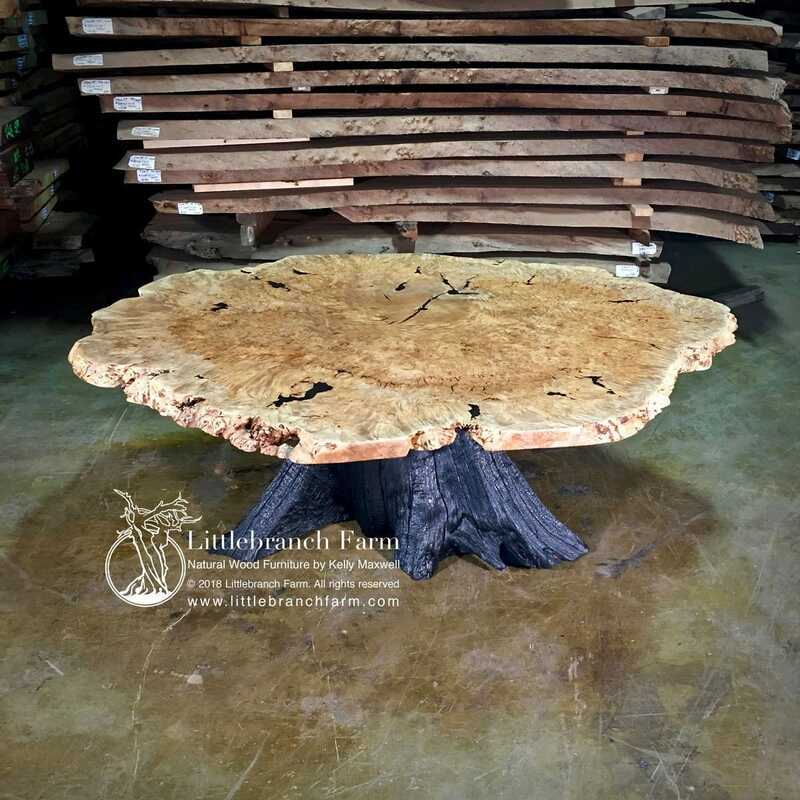 This burl wood live edge table is built with a salvaged redwood root base that is supporting a 54″ round oak Burl. It is a high top style rustic table. A live edge table is simply a wood slab with the outside of the tree still attached. Not to be confused with a bark edge which is not common as most barks will separate from the outside of tree is the drying process. 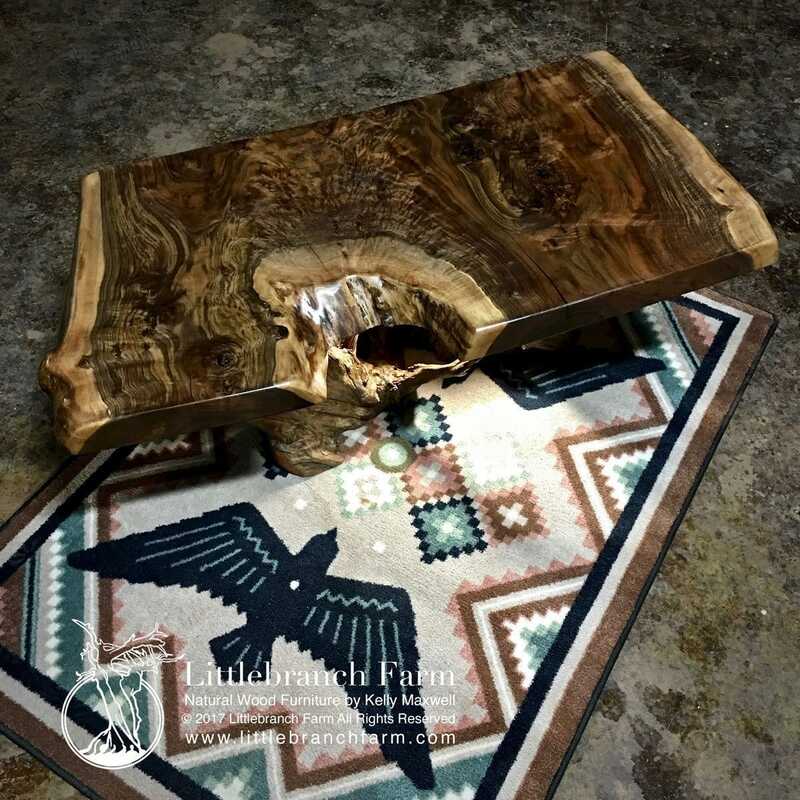 Below is an example of a solid tree wood slab with the natural live edge attached. It is a massive Claro walnut wood slab milled from a tree that has lived its life. Also, to cut the cost several smaller wood slabs are glued together with live edge glued to the outside. Normally these are thinner around 1″ cutting cost. Some production furniture shops will cut a faux live edge. Unlike glue up tables, most solid wood slab tables finish at 2″ to 3″ thick. Thus the increase in cost. Lumber is sold by the board foot which is length X width X thickness divided by 144. Massive Claro walnut live edge wood slab. This wood slab will make a great rustic dining table. Why are live edge tables so expensive? You may have noticed prices range from under a couple of thousand dollars and up. Pricing a live edge table is complex and you must compare apples with apples and understand what you are buying. As I stated earlier lumber is sold by the board foot. Prices differ from one wood species to another. 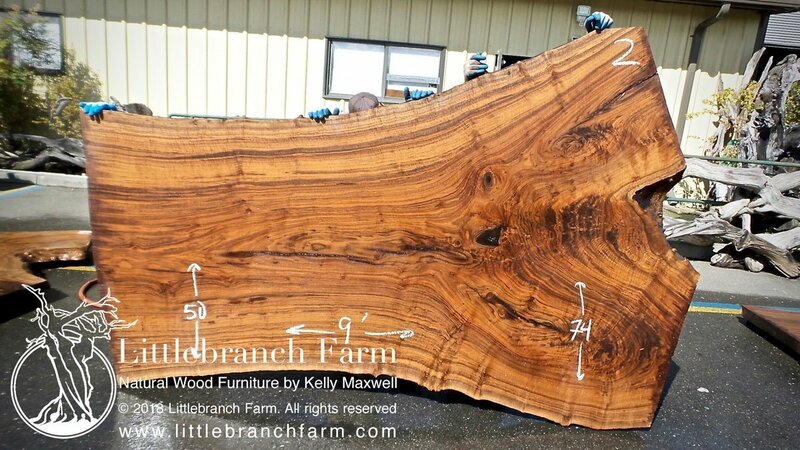 Also, in the live edge wood slab world size of the wood slab has a factor in the price. For example, a Northern California Walnut 4′ wide 12′ long 3″ thick is rarer than 2′ wide 12′ long 3″ thick. Thus the wood larger slab is more valuable. Wood species also has a factor in the cost of a live edge table. But not all trees make great wood slabs and yes how they are milled stored and dried make a difference in the final natural wood furniture piece. Natural wood coffee table Made from a Claro Walnut live edge wood slab. 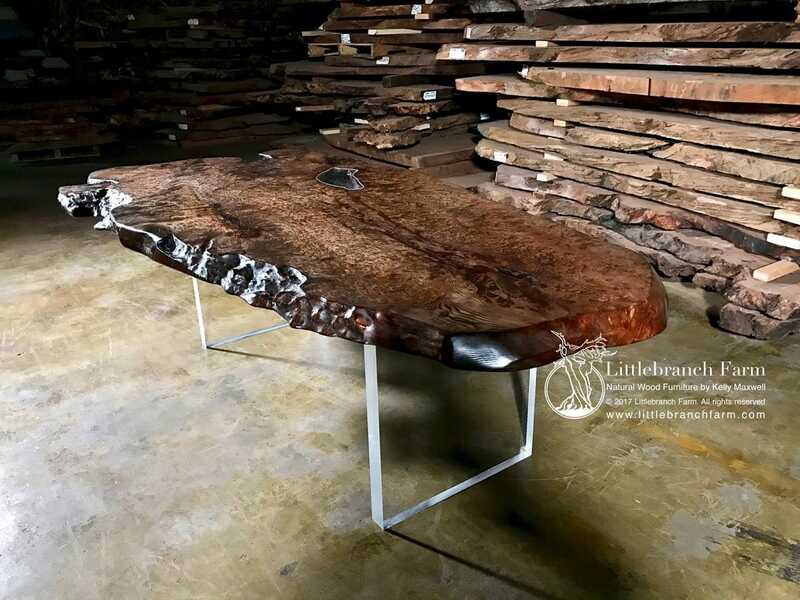 Lace burl redwood wood slab table with acrylic slab legs. 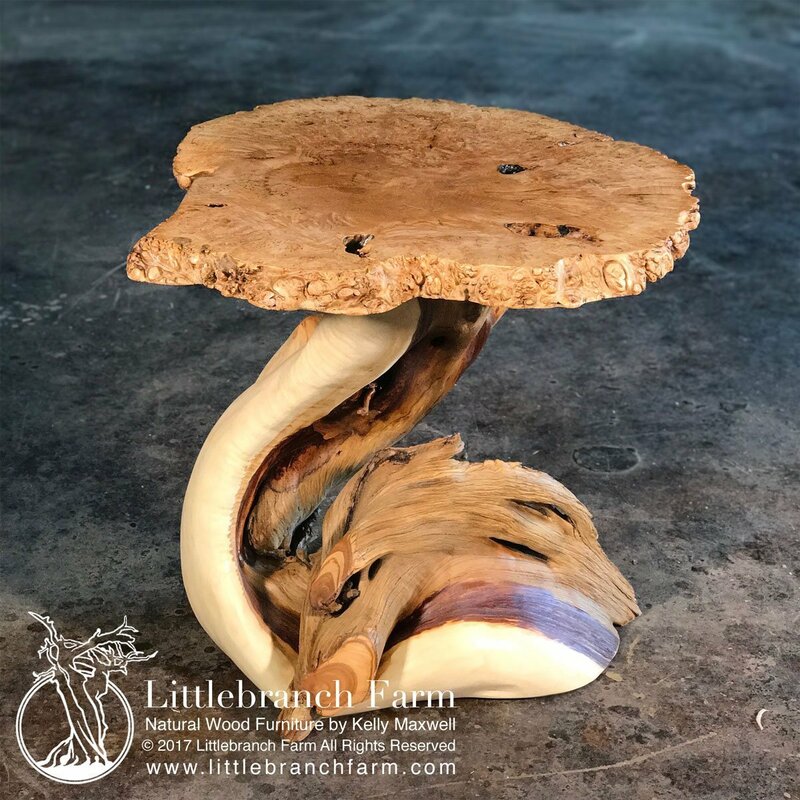 Which woods make the best live edge table? With over 60,000 wood species around the world, how do you choose? A good rule is staying close to home, by this I mean to stay within a few thousand miles. Also, it is a good idea to look for a wood monger that believes in ethically sourcing their logs. What is ethically sourcing? Basically, in a nutshell, it means not cutting a living tree unless it must be removed because of construction or it is a hazard. Tree have life cycles. But back to what is the best wood for live edge furniture. Within the USA the most stable is old growth Redwood, but Black walnut, Cherry, and Claro walnut are also great options. Oaks whether, red, white or black oak are also options along with sycamore and maple. Each species has its own challenges but finding a custom furniture maker that specializes in live edge furniture will help. Maple burl wood rustic dining table supported by a fired charred western cedar root. Building a live edge table is a great DIY project. But finding quality wood can be difficult but not impossible. A few simple questions to ask are – when was the live edge wood milled? Was it kiln dried or air dried? Air dried wood takes 1 year per inch for most softwood species and longer for hardwood species. Kiln drying will speed this up but the moisture should be around 16% before it is placed in a kiln. To date, I have been unable to find proof that one is better than the other. With 18 years as a custom rustic furniture maker in both rustic furniture and live edge furniture, my preference is air dried. 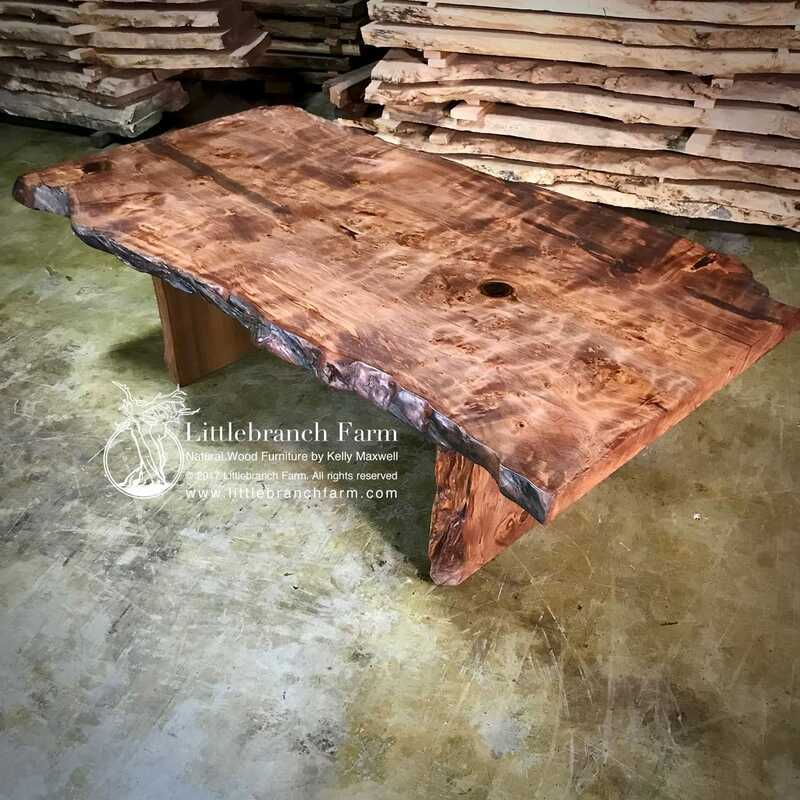 In building a live edge table whether a coffee table or dining table one of the key tips is starting with quality wood, then sand and sand some more…..
Natural wood table features a rare end grain double heart cypress dining table. It also features a modern metal base. Also, remember quality finish is not just in a can but rather a process. Woodworking, in general, is a process with many paths. 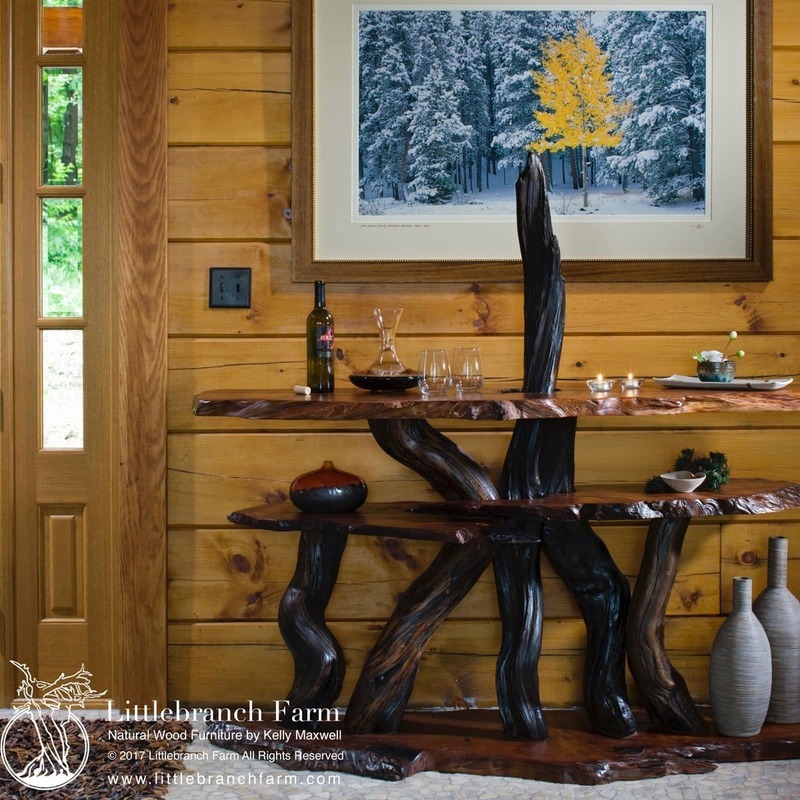 As a custom furniture maker that specializes in rustic furniture and live edge furniture. Yes, these are basically the same style and use the same skill set. 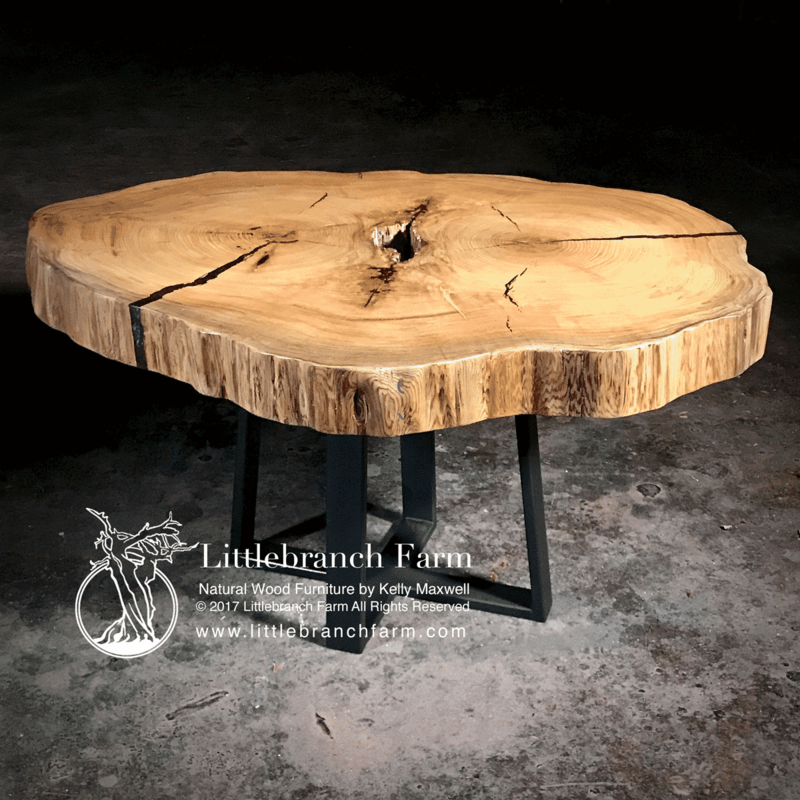 A Live edge table is also known as a rustic table or natural wood table. Although a live edge table must have a living edge and the others do not have that requirement. Besides a live edge table, this unique wood is also used in wood countertops and our rustic vanity designs. We welcome visitors at our Nashville, TN studio/gallery. 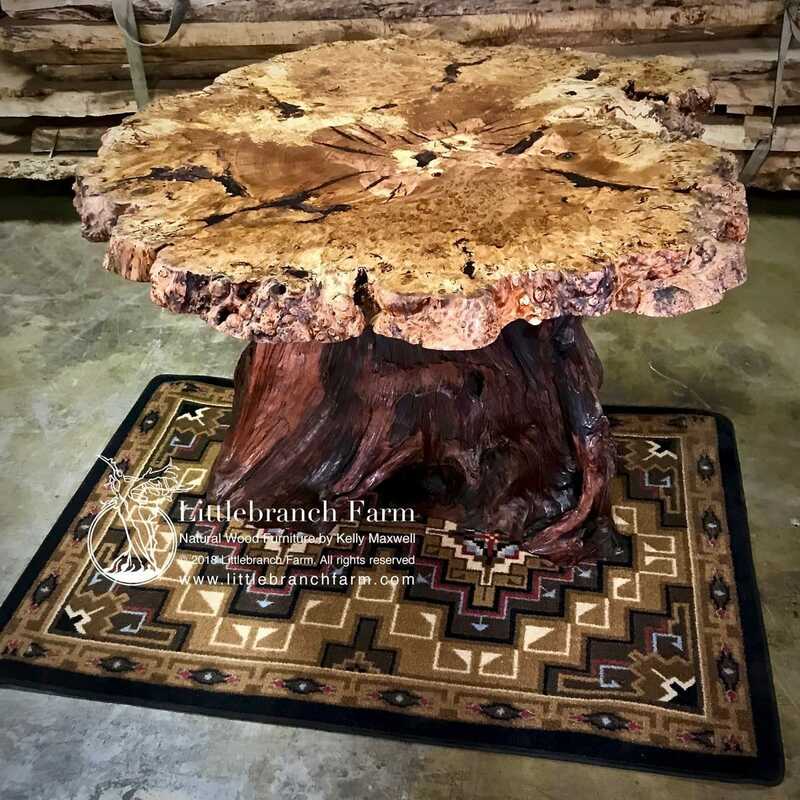 Maple burl wood table designed and crafted to highlight the natural beauty of this rustic style live edge table. Another example of a live edge table built by our custom furniture maker using salvaged old growth redwood wood slabs. Since 2001 Kelly Maxwell has built custom furniture using logs and live edge wood in his designs. He has a DVD teaching how to build a log bed. He welcomes to opportunity teach and encourage other woodworkers whether professional or DIY craftsman. A little-known fact is he also sells unfinished air dried wood slabs native to the Pacific Northwest.